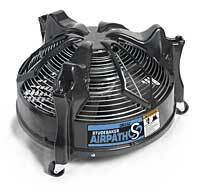 The Studebaker AirPath from Dri-Eaz drives an airflow at 40 mph to get carpets dry in minutes. The device uses an eight-bladed fan to draw warmer, drier air from above and blow it down and across the entire surface of carpet - creating a 360-degree horizontal air stream. It uses a one-horsepower motor and two-speed switch, and is designed with a stackable ABS thermal-formed shell.